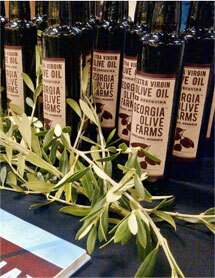 Our Pure Georgia Arbequina oil is only available in limited quantities each harvest season. This oil is 100% Georgia grown, EVOO. Its Green and buttery with a fruity finish. For wholesale pricing, contact Brandi Bennet at 229-482-3505 or email us. Arbequina is the major olive tree of California and Catalonia in Northeast Spain. As the crown is small, It is suitable for dense planting but hard to harvest by conventional shakers. The oil is considered of high quality. The production starts early and is high. Arbequina is considered frost hardy and well adapted to different soil types. Koroneiki is an olive tree of medium vigor with a spreading habit and an open canopy. The leaves are elliptic lanceolate short and narrow. The fruit is small ovoid and slightly asymmetric. 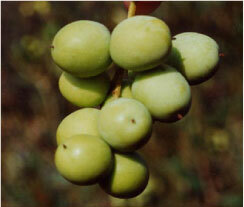 It ripens early and has high and constant yields with a very high content of oil. An early bearer it also flowers early and produces lots of pollen. Often planted with Mastodies as a pollinizer. This is a good drought resistant variety but one that does not tolerate cold well. It is resistant to olive leaf spot but sensitive to olive knot. The oil is high in oleic acid and very stable. This variety originated in Greece. 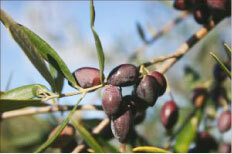 Arbosana olive trees start producing olives after two years, and reach full fruiting in five years. 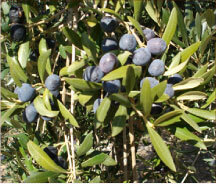 The olives are small, yet produce a good oil yield of 19 to 20%. The oil has a pungent fruity taste. It is often blended into oils from other olives to improve their taste and aroma. These trees can be planted very densely in orchards. This variety also has its origins in Spain.